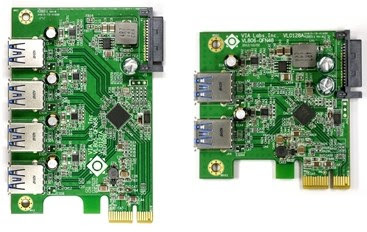 VIA one of the leaders in computer hardware solution designer, introduced today a new USB 3.0 based chip controllers, the VIA VL805 dual-port and VL806 quad-port with a transfers rates up to 5Gbps when in USB 3.0 standard mode with an advanced enhanced performance and mobile devices charging "Charging Downstream Port" which enables both fast data sync and rapid charging with compatible devices. So if you still using an old motherboard with USB 2.0 support, this PCIe can be a good choice for you, check out the press release bellow for more details and specifications. The VIA VL805 and VIA VL806 comply with the Universal Serial Bus 3.0 specification and Intel's eXtensible Host Controller Interface (xHCI) 1.0 specification and add native inbox driver support for Windows 8. VIA VL805 and VL806 host controllers are USB-IF certified and are currently shipping. "The VIA VL805 host controller is a feature-rich product that offers many tangible enhancements over previous generation devices including higher throughput, charging capabilities, and support for USB Debug Port" said Terrance Shih, Product Manager, VIA Labs, Inc. "With the smallest package design and native support in Windows 8, the VL805 and VL806 provide easy and cost effective ways for motherboard and embedded system manufacturers to bring additional USB 3.0 to their product lines."